Borage, like so many of my favorite herbs, is native to the Mediterranean region. Historically grown for both food and medicine, it has been recorded that Ancient Greek soldiers would drink a mix of Borage tea and wine to fortify themselves before battle. Borage is a sturdy plant with thick, hairy, prickly, leaves and pretty star-shaped purple flowers. It grows about 2 to 3 feet tall and does well in both sun and part-shade in zones 2 – 12. I found it incredibly easy to grow from seed, and once planted, you will never have to buy seeds again because Borage is a generously self-seeding annual. Seeds can be directly sown into the garden in the spring. There are many reasons why Borage deserves a spot in our gardens. To begin, Borage attracts bees, and the more bees around to pollinate, the better. If you happen to keep bees I have also read that Borage creates a beautifully tasting honey! Borage also makes a wonderful companion plant for tomatoes by repelling the tomato hornworm. 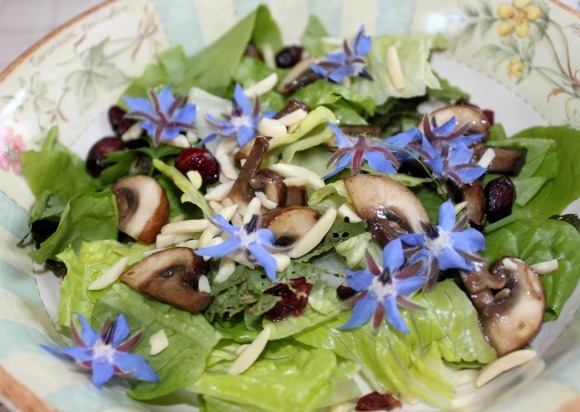 Borage leaves and flowers have a mild cucumber flavor, and both are delicious in salads. Young leaves are best for eating raw, whereas older leaves can be cooked and served as you would any green leafy vegetable. I have also been known to add a few leaves into my green smoothies! Years ago women would also candy the borage flowers or make borage syrup. Even without candying, the flowers look pretty decorating a cake or dessert, or frozen into ice cubes for a pretty summer drink. Some cooks have become very creative with borage by incorporating it into soups, sauces, pestos and pasta filling. Although sources differ on the medicinal uses of borage, all agree it is high in nutrients (calcium, potassium, and iron to name just a few), as well as a good source of the essential fatty acid GLA. Fever reduction, relief from skin complaints, and help with breast-milk and reproductive health, are some of the other uses mentioned for this hardy plant. So perhaps now you will understand why I am always happy to see this plant popping up all over my garden! 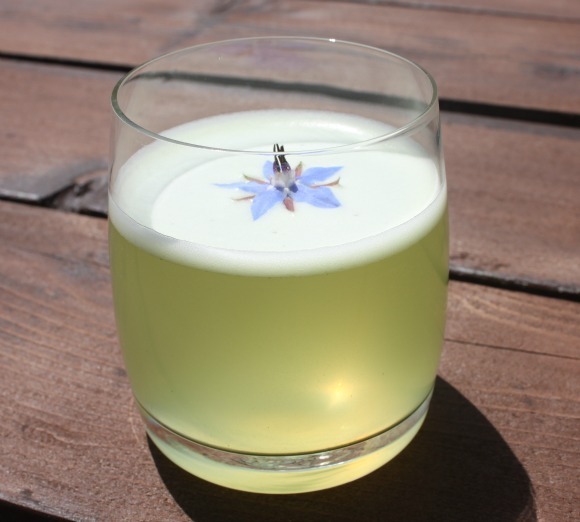 And if your summer has been as hot as ours has been, you might enjoy a recipe for a cold, Borage-infused, lemonade. Serves 4. Put the leaves, juice, water and honey in a blender and blend until smooth. Strain into glasses and garnish with Borage flowers. Enjoy! For more creative culinary ideas check out the original recipe, and other interesting Borage recipes, here. 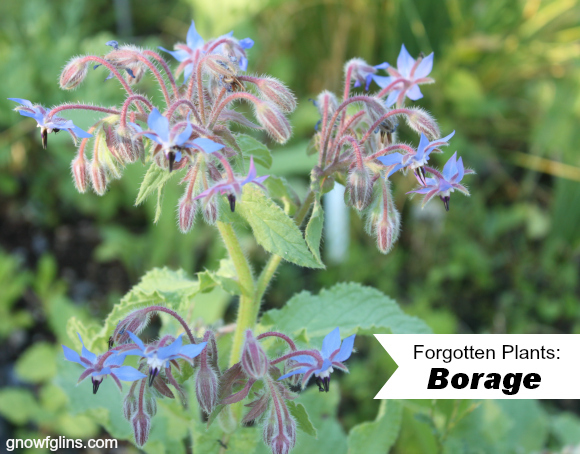 Do you grow Borage in your garden? What are your favorite ways to use this wonderful plant? I put some in this year. It was my second time to try it. I started it from seed and planted the seeds the same time I put in my tomato transplants; putting the borage in between the tomatoes. That was something of a mistake because the tomatoes were mature before my borage was and we still had a problem with tomato hornworms. Next year, I’ll set out transplants if I decide to use them as companion plants. They are doing fine now, and blooming beautifully. I found that when it got well above 95, they weren’t terribly happy but a thick layer of hay for mulch has solved that problem. Very pretty plants. I love the color progression of the blue flowers. They are definitely a keeper. I look forward to trying your lemonade. I thought I read somewhere that chickens love to eat borage. Do know if that’s true? I don’t have chickens myself, but Polly mentions below that her chickens ate every single one of her Borage plants, so it seems that it’s true! What a thrill! I was just admiring my naturalized Borage throughout my garden and trying to remember what all I could do with it! Thanks! I’m so glad I was able to give you some ideas! Enjoy! Andrea, thanks for the inspiration. The borage can start growing like weeds… then it’s easy to take it for granted. But I too, like to see it flourishing in the garden. One fine feature: it’s great in the compost pile. The older plants have hollow stems, which help aerate the pile. And when I’m feeling patient enough to pick them, I’ll grab a few flowers to decorate salads. But now that I’ve seen how pretty your Borage Lemonade looks, I’m encouraged to blend the leaves into some lemonade. Looks so good! 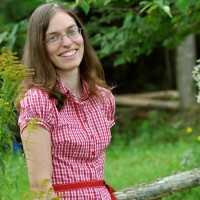 I never thought about plants that might be good for the compost, too! Just another reason to love Borage! You know, borage is the original garnish in a Pimm’s Cup, not cucumber! In addition to all the wonderful suggestions you’ve shared, I also use the leaves to muddle along with some mint in my homebrew kombucha. A little ice, sometimes some raw honey… perfect midday mocktail! I must admit I had to look up “Pimm’s Cup” but that is an interesting piece of history. I find it fascinating how plants fall in and out of fashion over the years. And your mocktail sounds delicious! A couple of years ago I planted a few borage seedlings in my garden. They did amazingly and self-seeded everywhere; I loved them, and the bees loved them. Then I got chickens, and discovered they love borage too… to the point that every borage seedling which pokes its head about the soil seems to disappear almost at once! This year I might need to plant some in my vege beds, which are safely fenced. It’s too bad you can’t teach chickens to share! 🙂 Luckily borage grows well among vegetables too! I was given a start years ago by my mother-in-law and she called it comfrey. Are these two different herbs or just closely resemble each other? Looking forward to trying the lemonade! Comfrey is a different plant in the same family. There are some similarities in that they have broad green leaves and both plants tend to be prickly, Comfrey has bell-shaped flowers of a purplish hue, and Borage has star-shaped flowers that are more bluish in colour. It is important to know the difference, as Borage is completely edible, but Comfrey is toxic to the liver and should never be eaten! It’s dangerous to mislabel plants for sale!Someone might ingest and have very bad reactions. Please notify a person in charge to correct their mistake immediately! Any herb/ plant can be misused especially when mislabeled. Borage, for one, has strong properties that can cause immediate and dramatic personality changes. All have warnings and some can be life threatening. Just so you know. Happy gardening! Comfrey has a long history of culinary use with both humans and animals and has been much maligned. In the seventies it was the mainstay of vegetarians as an edible protein and available at the greengrocers. It has been eaten by humans for centuries. It has also been put forward as an anti cancer food. The 2 studies which show damage to the liver in rats were fed gigantic quantities of comfrey alone, not part of a normal diet and a standard diet shows no ill effects, but actually beneficial effects. I just love perusing my garden popping borage blossoms in my mouth, yum. Great in salads. I’ve been a fan of borage for years, glad to see you’re helping spread the word about its charm! My daughter’s birthday cakes are always decorated with the end of season flowers, and I love just putting a few leaves in my water bottle. Glad to have all these other ideas for how to use this delightful plant. Thanks! I am so happy to have stumbled across this! I just bought borage seeds to attract bees and eat their flowers while I walk through the garden. I had no idea other parts of the plant were edible. I am excited to go do some more research on this little plant ? ?